QODE™ Ultimate Pro Keyboard Case for iPad Air 2 (App enabled) is rated 3.8 out of 5 by 78. 1. The full coverage protection of a case. 2. The convenient detachability of a cover. 3. The keyboard experience of a laptop. Sometimes you just want to use your iPad Air 2 without the keyboard. While other keyboard case designs make it difficult to remove your tablet, the QODE Ultimate Pro Keyboard Case makes it easier than ever. Simply detach and go - the standalone case keeps you protected. 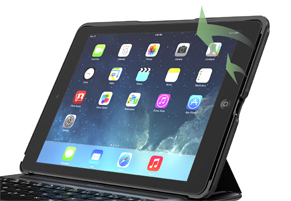 The case by itself even works with your Smart Cover, so your iPad Air 2 always has complete dual-sided protection. We've completely redesigned the typing experience to make it even more like using an actual laptop. The Qode Ultimate Pro Keyboard Case is the only keyboard case on the market to have the exact same number of keys as a laptop keyboard, so there's no sacrificing functionality. With a wider keycap shape and improved key pitch, the keys perform better than the competition, making the Ultimate Pro the fastest and most comfortable keyboard case available. The QODE Ultimate Pro Keyboard Case also features backlit keys, to make typing in lowlight or no light even easier. Choose between three brightness levels to further customize your typing experience. 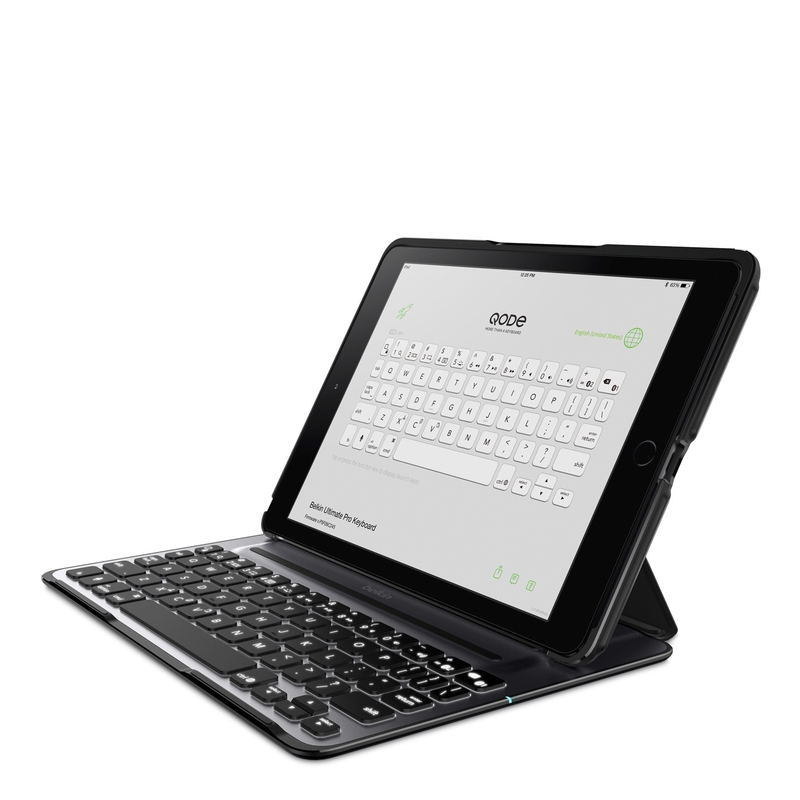 The free QODE App brings a wealth of additional features to this lightweight keyboard. From quick launch shortcuts to load programs and webpages in an instant, to multiple languages and layout options. Visit the APP tab for details. Not only does the keyboard wirelessly pair to your iPad Air 2, but you can use it by itself and pair it with other devices. Better still, you can pair up to two devices at once. So when you're typing an email and get a text message on your phone, you can toggle over, respond and get back to your email without skipping a beat. *Bluetooth® Smart Keyboard pairs with other Bluetooth 4.0 devices including iPad Air, iPad mini, iPad 4th gen, iPad 3rd gen, iPhone 5/5s, iPhone 5c, iPhone 4s, iPod touch 6th gen, MacBook Air, MacBook Pro, Mac mini and iMac. Now you have even more choices when it comes to viewing your iPad Air 2. In addition to the two magnetic viewing angles, you can detach your tablet to position it in either portrait or landscape. Magnets in the case match up with the magnetic fabric hinge for a secure hold in any position. The keyboard is so smart, there's no need for a power button - it turns on when you need it and off when you don't, simply by sensing the weight of your iPad Air 2. And when you're using the keyboard by itself, it's the fabric hinge that lets it know when to turn on. So no matter which way you prefer to use it, you'll never have to worry about accidentally draining your battery. Bluetooth® Smart technology also uses less battery power, so you can go longer on one charge - up to 1 year, to be exact. *Active Battery Life based on a fully charged keyboard used continuously with backlit keys turned off. Known for it's strength and amazing lightness, we used anodized aircraft-grade aluminum to make the Qode Ultimate Pro Keyboard Case as light as possible. So it's incredibly durable, and incredibly portable. The keyboard case's SoundFlow design directs your iPad's sound toward you, making music and movies more powerful and clear than the iPad without the case. The keys on every QODE Ultimate Pro Keyboard Case have been tested over 10,000 times to ensure their performance and responsiveness. Belkin products are designed with the highest quality materials and put through hundreds of rounds of testing to meet the standards you deserve. Our quality teams go above and beyond, setting standards over the minimum requirements for fabric tests, drop tests and durability tests. When you receive your Belkin product, you're getting the promise of our very best work. The App keeps a constant eye on your battery, letting you know how much power you have left, and notifying you when it’s time to charge up. Set up shortcuts to access apps and websites using keys on your keyboard. Your favorite locations are only ever a click away. Swipe through different languages available on your keyboard, and see them laid out on screen. You can even print or save the layouts for reference while you work. While you work, the App regularly checks for software updates to enhance your keyboard. It will instantly notify you of any new software and ask if, and when, you would like to install it. The App has a direct route to QODE so giving us feedback on your keyboard has never been easier. Whether it’s a suggestion to improve our keyboards, finding the answer to a question, or just to tell us how you like the App, we look forward to hearing from you. Much like you, our keyboards speak multiple languages. Swipe through different languages available on your keyboard, and see them laid out on screen. You can even print or save the layouts for reference while you work. 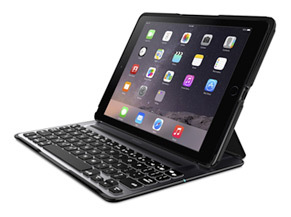 This first-in-class keyboard case is the ultimate companion to the iPad Air and comes in white or black. 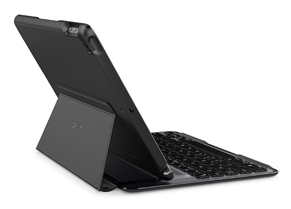 It’s the only keyboard case with a unique 3-in-1 solution that offers the typing experience of a laptop, dual sided protection like a folio, and the convenience of a stand-alone case. Constructed of aircraft-grade aluminum alloy, this keyboard case is durable and light. 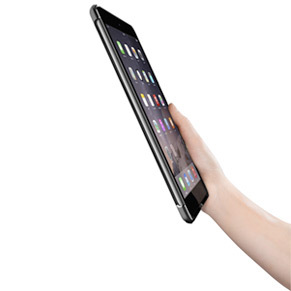 In fact, the keyboard is thinner and lighter than the iPad Air itself. The laptop-style keyboard is designed for the most comfortable and accurate typing experience available on an iPad keyboard. In most keyboard cases, multiple keys are combined to save space. 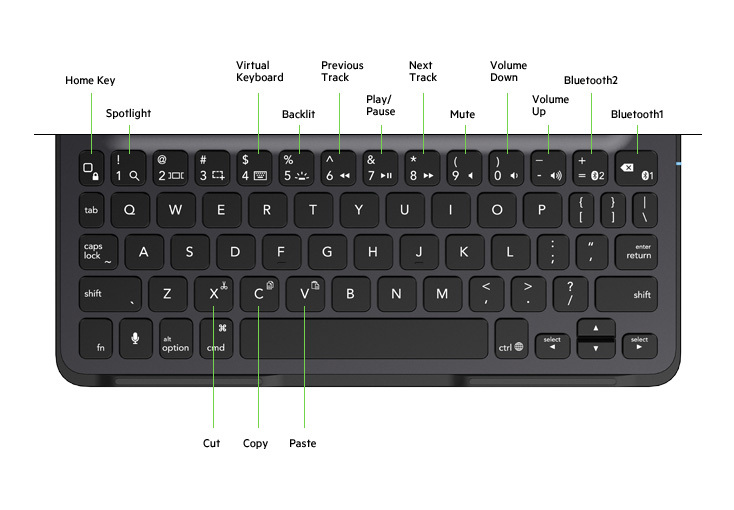 But on the Ultimate Pro you’ll find the same number of keys and in the same familiar layout. Unlike our competitors, our keys are also large, well-spaced, with just the right amount of responsiveness and key pitch. It feels just like typing on a laptop keyboard. In fact, it also has backlit keys with 3 brightness levels. 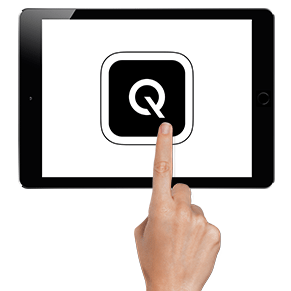 The QODE APP is designed to improve the premium QODE keyboard experience with additional features, enhanced functionality and greater flexibility.